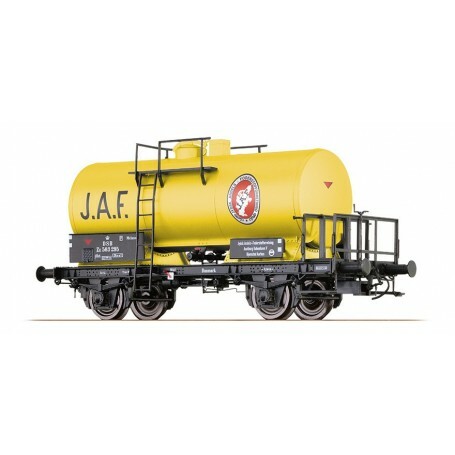  Tankvagn ZE typ DSB 503 295 "J.A.F." Tankvagn ZE typ DSB 503 295 "J.A.F." Tankvagn ZE typ DSB 503 295 'J.A.F. ', längd över buffertar 54,9 mm, epok III. In the mid 30ies, the progress in lightweight construction led to new generations in wagon building in rapid succession. The introduction of welded tanks allowed weight savings, the benefit of which was increased cargo weight. Consequently, the wheel base of the classical two-axle tank wagon design was increased from 4.00 m to 4.50 m starting at the end of thirties. The running gear corresponded to the design which was simultaneously developed for the welded DR wagons, and was conspicuous by its long suspension springs for smooth running, even at higher velocities. The resulting design was built by many European wagon factories in very large numbers until 1943 - alone MAN, although no classical tank wagon manufacturer, delivered 2250 units. In addition to a few private owners, the sham firms and camouflage organizations of the German Reich were predominantly supplied as part of the war preparations. These included the Wissenschaftliche Forschungsgemeinschaft (Wifo) and various oil associations (Oelvereine). In another case, the wagon user was more clearly identified by the name Wilhelmshaven Naval Dockyard; these wagons were used for the fuel supply of the submarine fleet. In the aggregate, far more than 10,000 units of these wagons with tanks of 20 m3, 22 m3 and 26.5 m3 were probably built. After the war, they were scattered all over Europe and, as a result, came into the possession of many mineral oil industry companies as private wagons. In addition to the classical grey-and-black paint coats, many wagons were given conspicuous advertising paint coats from white and yellow (Mobil / Shell) up to green and blue (Texaco / Aral). The last wagons were still being used in 1989 in the fleet of the GDRs Deutsche Reichsbahn.